If you like caramel and burnt sugar flavors, this recipe will tickle your taste buds. Dulce de leche is sweetened condensed milk that has been cooked down until the sugar has caramelized, yielding a thick, sticky, caramel-flavored milk with a creamy, spreadable texture. While it can be made at home, it can also be purchased. I use Nestlé brand, which can often be found in the Spanish foods section in the supermarket. The dulce de leche is combined with yellow cake, dipped in milk chocolate, and drizzled with caramel, and the result will appeal to kids and adults alike. 1. Combine the cake with 3/4 cup of the dulce de leche. Test by compressing and tasting and add more dulce de leche only if needed for flavor and moisture. Roll into golf ball–size cake balls. Refrigerate until firm. This can be done 1 day ahead; store in an airtight container once they are firm. 2. Line two rimmed baking sheets with parchment paper or aluminum foil. Melt the chocolate in the microwave or a double boiler. Dip the balls one at a time in the chocolate, encouraging any excess chocolate to drip back into the container. Place, evenly spaced, on the prepared pans. Refrigerate briefly until the chocolate is set. 3. Melt the caramel in the microwave until fluid, watching carefully so that it doesn’t boil. 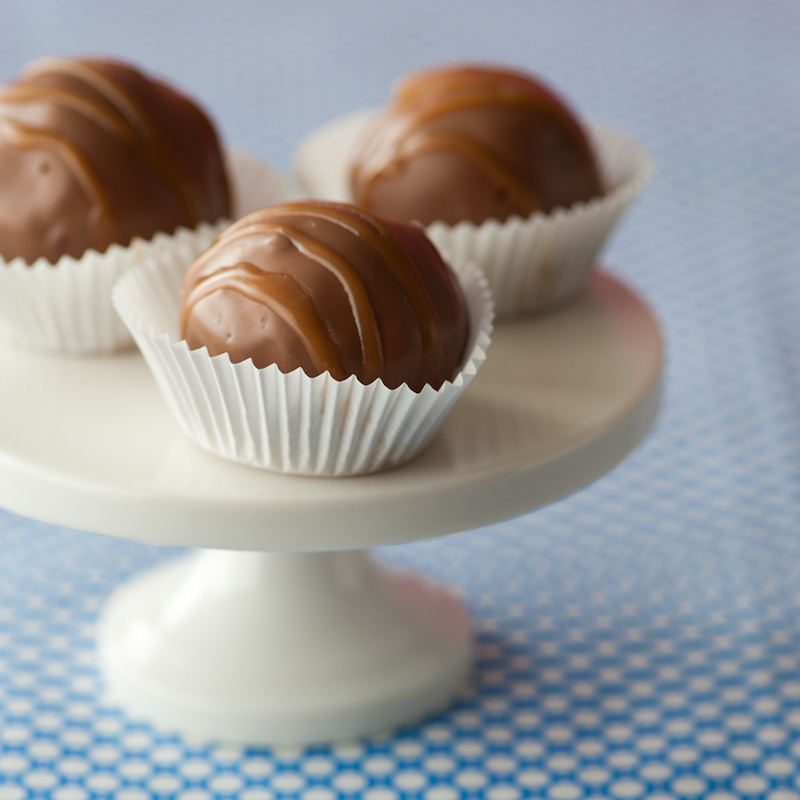 Use a fork to drizzle caramel zigzags on top of each ball. Refrigerate again until the caramel is set. Trim the bottoms, if needed. Place each cake ball in a paper cup, if desired. Place in a single layer in an airtight container and refrigerate for up to 4 days. Bring to room temperature before serving. Note: Block caramel, especially Nestlé brand, is available from several baking supply sources and has a far superior taste to the smaller individual caramels that you might find at the supermarket. It is well worth seeking out.